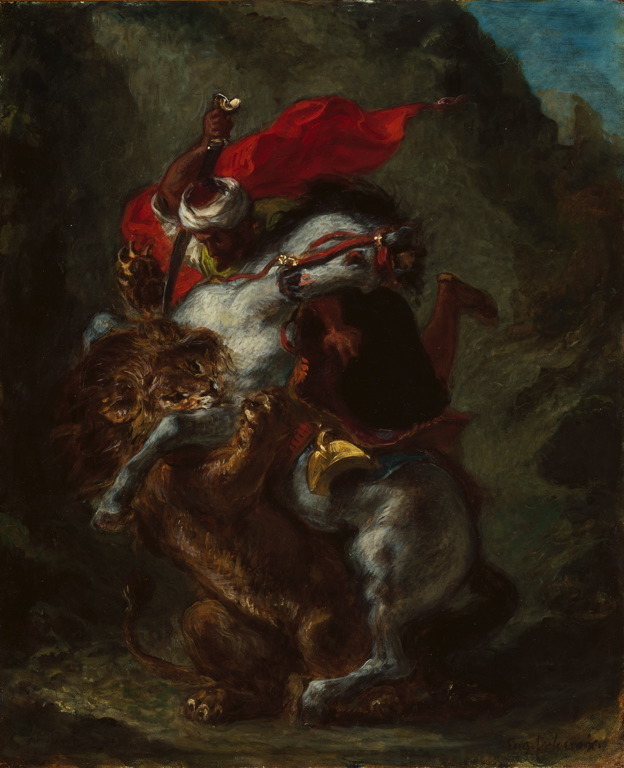 It took just one trip to the Orient to change Eugene Delacroix's work forever. In 1832 he toured Morocco with King Louis-Philippe's representative of the Sultan and was refreshed by a culture so vastly different to the French. 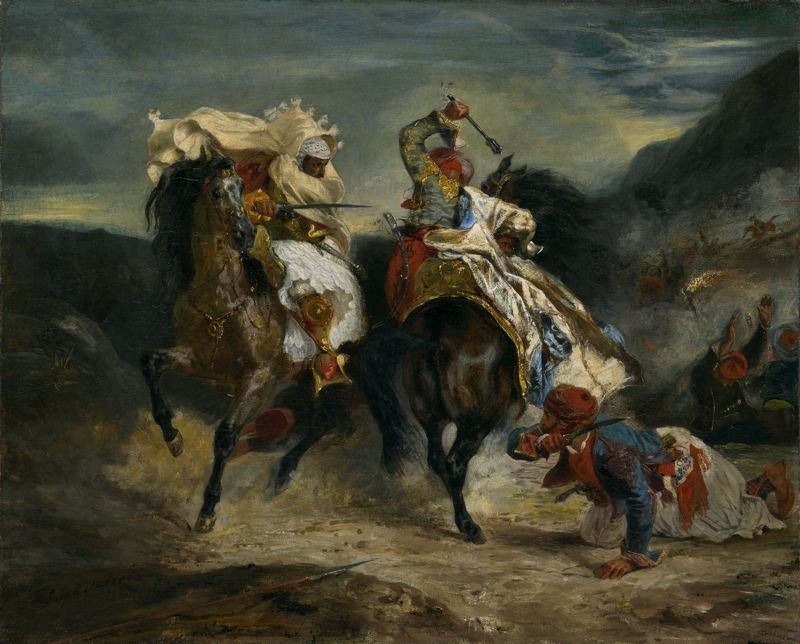 The brightly colored, flowing costumes, the Arabs and their women, and the enchanting horses captivated the artist and consequently, many later themes of Delacroix's canvases reflected scenes of the Orient. 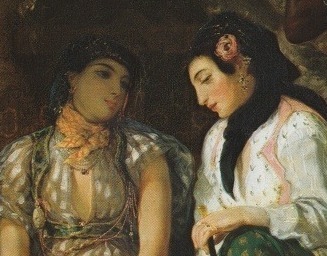 Women of Algiers in their apartment is his first artwork resulting from his time in Morocco and is based on Delacroix's visit to a Muslim Harem. Muslim harems were heavily guarded and so it was difficult to enter one. Delacroix was fortunate enough to meet a man who owned a private harem and so he was allowed to enter and stay for some time and was even given permission to painted several watercolor sketches. 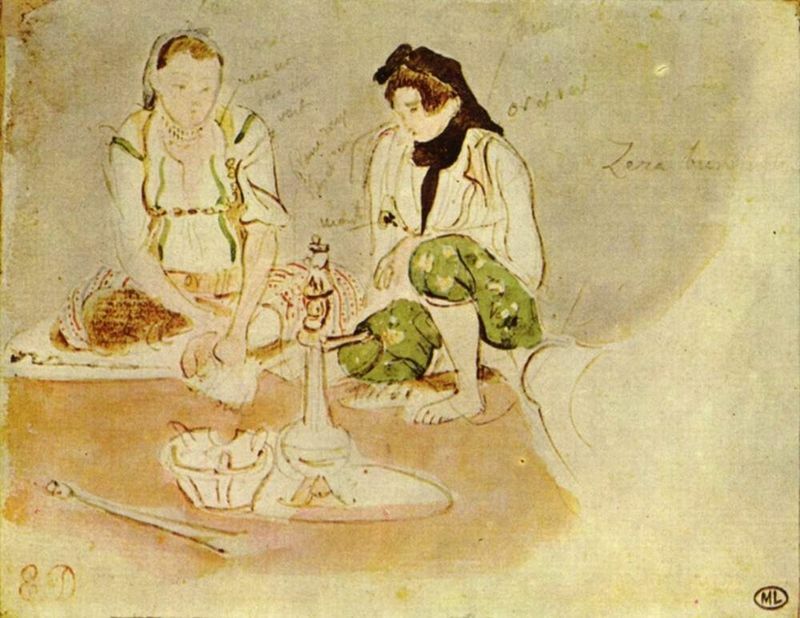 From these sketches Delacroix painted Women of Algiers in their apartment upon his return home and aimed to convey its serenity and sacredness to the outside world. 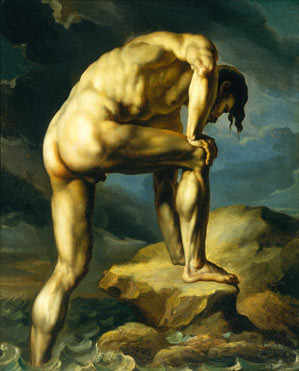 This work was exhibited in the 1834 Salon. 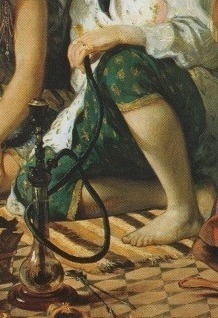 In Women of Algiers in their apartment Delacroix's masterful color technique and approach to lighting depicts a culture completely different to his own. He changed the pattern of his brushstroke and his subject matter evolved to more modern themes. The main activity in this image takes place at the lower center and the left-hand corner; attention shifts from each woman like a ping pong ball, starting with the woman directly in the center, then to the woman on the left, back to the center to the woman in the white shirt and finally to the servant girl. The positioning of the figures combined with the lighting keeps the eye moving. There are many textures in this harem scene. 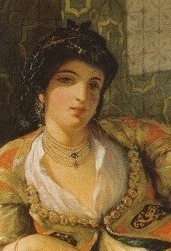 The technique of Delacroix's color and brushstroke ranges from smooth to rough, dull to shiny. The dull carpets, tiles and cushions make the shining mirrors, silk, jewels and glass shimmer even more fantastically. Like most of his other works, the majority of this canvas is painted with dark colors. Delacroix chose such a palette to make his bright colors and the direction of his lighting stand out even more. The overlapping of colors, bright and dark, mix to create a refined but vibrant canvas and this was the artist's most sumptuous use of color to date. The lighting in this piece alters the colors and shapes of the scene. Delacroix bathes the women in a sensuous light, creating a calming effect. The lighting truly dominates the piece and gives it the character that makes it so memorable. The relaxed poses of the three women and the lighting create a calming but sensuous mood. If Delacroix was attempting to invoke serenity, he certainly succeeded. The artist uses a small brushstroke but thick paint to give the room a welcoming feel. Overall in this work he practiced a freer brushstroke than usual. 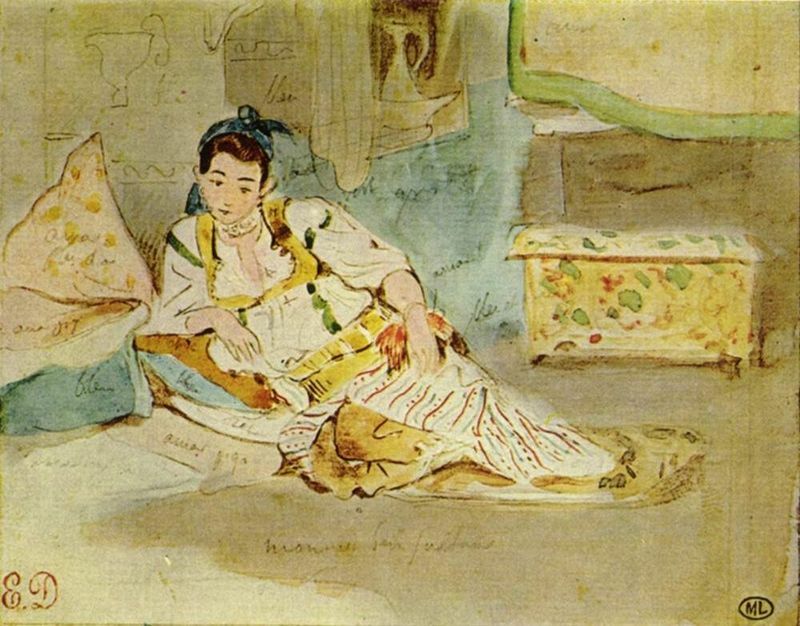 In the few hours that Delacroix spent inside the harem, he painted a few preparatory watercolors of the women and their surroundings. Though they were just quick, their beauty cannot go unnoticed. 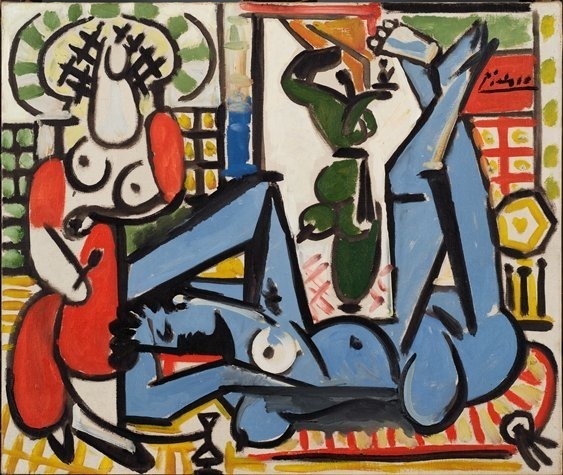 Picasso found Women of Algiers in their apartment particularly intriguing and painted his own version. At the age of 34 Delacroix found himself traveling in Morocco, a land completely unknown and different. His extended stay lasted six months and he was so mesmerized by this new orient that it captured the subject matter of his work for the remaining years of his life. 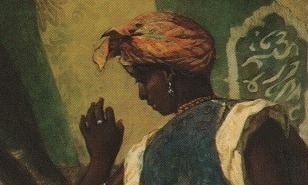 Women of Algiers in their apartment was the first painting of such a theme. In this piece Delacroix captured the brightly colored textiles, the beautiful women and the sacredness of the culture and beautifully represented the beauty he had witnessed within the walls of the harem. The impact of literature and both historical and contemporary events, coupled with his innate artistic technique created an explosive viewing experience on canvas. The settings around him also shaped his work and none more so than Morocco. Delacroix's work changed the art world forever and his technique had a lasting impact on the Impressionist and Post-Impressionist movements. 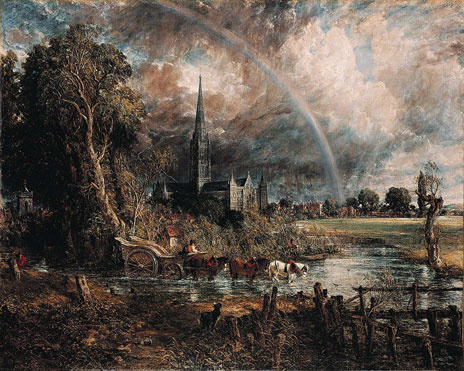 Romantic painters like Delacroix, Gericault and Constable were part of a complex multimedia philosophical movement, involving the literary, visual, and intellectual arts.